Can you ever remember a time when you have said ‘yes’ but you really mean ‘no’? And perhaps followed through based on obligation and felt resentment afterwards? The recent term for this habit is called ‘People Pleasing’. We all like to please others but if (in our perspective) we are sacrificing our selves in the equation, we create a level of stress that is felt physically in the body. The consequences of stressful thoughts and emotions are well studied: we release stress hormones from our adrenals (adrenaline and cortisol) and this initially quickens our heart rate, sends blood to our brain and muscles, and shunts our food resources into burning. But that’s not where it ends. Generally speaking, we were designed to run from bears. So we would see a bear, release hormones, run to a cave…. and things would go back to normal. We would not suffer nutritional or hormonal imbalances beyond that. But we don’t do that. 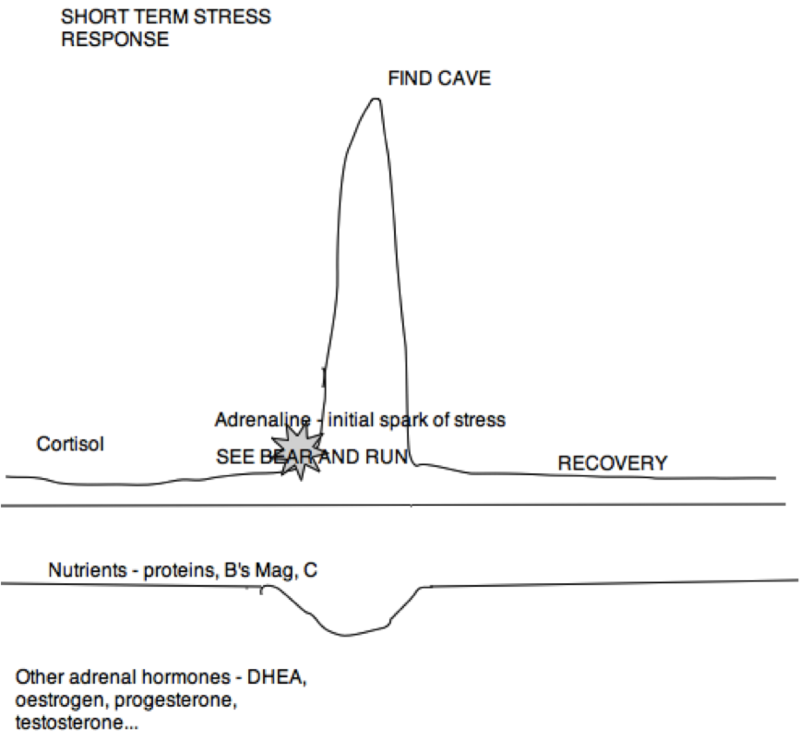 This ongoing stress process aims to sustain the production of stress hormones. 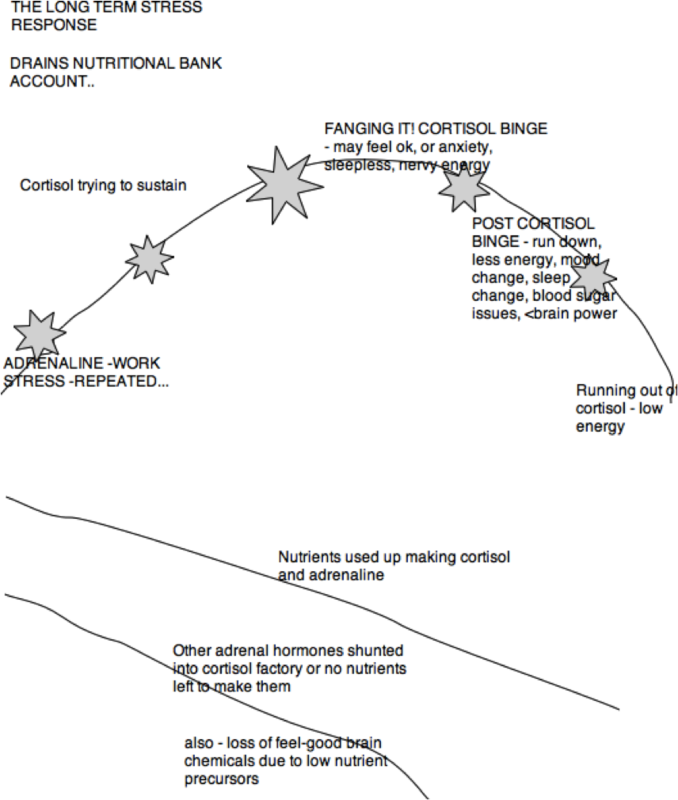 Hormones are partially made from nutrients, so the body shunts nutrients into the factory. Over long periods of time, this is at the cost of other hormones, such as progesterone, oestrogen, and testosterone, and energy giving DHEA; plus neurotransmitters such as serotonin (for relaxed happiness) and dopamine (for motivation and focus). All of these are crucial to our mood and cognitive function. Excessive stress hormone levels also dampen immunity, strain the heart, and affect digestion, weight, blood sugar, and sleep. Eventually it can drain us of energy. (However, nutrient loss is individual and multiple other deficiencies may appear). Supplementing to accommodate “the wobble” can help to prevent a large number of stress-related issues arising. But. There is another major factor that reduces the wobble. Doing less of what we could comfortably call non-crucial, and taking care of ourselves. This is of course subjective, but it might include less face book, less news reports, less obligation dinners with acquaintances, or taking less responsibility for the smoothness of every conversation. It might mean saying no, and teaching others what our boundaries are. It might mean focusing on the things that work for us. And it might mean shifting our perspective and deciding that our choices are empowered – they are better than all of our alternatives, and we are making an investment for our conscience, family etc. In my experience, when we genuinely say ‘yes’ and mean it, we suffer much less during a challenge. If we take care of ourselves as best as we can under duress, we are less likely to need loads of expensive intervention in the long run. If you would like to talk more about any of these issues raised, please feel free to book a session with Linda (counseling, naturopathy/nutrition, or both).